When I was studying abroad in New Zealand, I would sit in my favorite coffee shop, Governor’s, write in my journal and listen to ben harper (come on, we all did it). But what I really loved there– was the tastiest lunch– a hot caramel (like hot milk and caramel) and a chick, cran & brie sandwich. Chicken, cranberry and brie is a very popular combination in NZ– available everywhere, even as a pizza topping. But, my favorite way to have it– is in a toasty sandwich. A quick note about roasting chicken. While this might seem like a lot of effort for lunch, roasting chicken is super easy. I learned how to do it from Barefoot Contessa. Before her, I was seriously intimidated by making chicken, and was always overcooking it. The main reason this would happen, is that I was constantly cutting into it, asking- does this look pink? The easiest way to get around this concern, is to invest in a meat thermometer, which you can get for $5. They say chicken breast should read 170 degrees. But really, if you are over 150, you are more than fine. Also, you will know the chicken is done when you poke into and the juices run clear. IF you are really really lazy- deli turkey works fine for this sandwich too. Wash chicken breasts. Pat dry. Place skin side up on baking sheet. Rub with olive oil. Liberally sprinkle with salt and pepper on both sides. Cook for 35 minutes. Wait until chicken is cool enough to touch. With your hands, take off skin and the breast off bone. Shred with your hands or cut w. a knife if you prefer. Assemble sandwich. 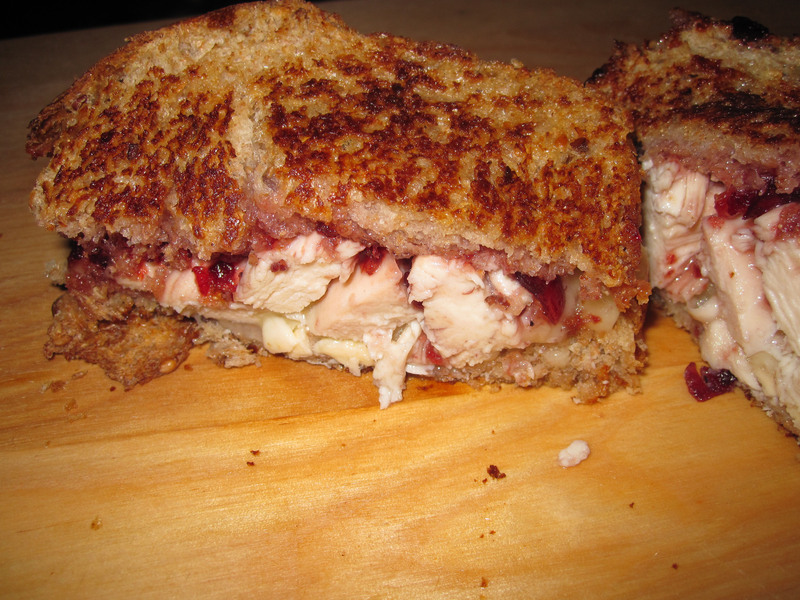 Spread cranberry sauce on bread. Add a couple slices of brie. Add some chicken. Toast sandwich. Making this at home, I recommend cooking this grilled cheese style– butter the outside of the bread and throw it in the frying pan. At work, I’ll just put in the toaster oven. How has no one left a comment on this delicious dish yet? Not even the mysterious “Jess P.”??? I’ll say this one looks fantastic. Probably tastes good, too.